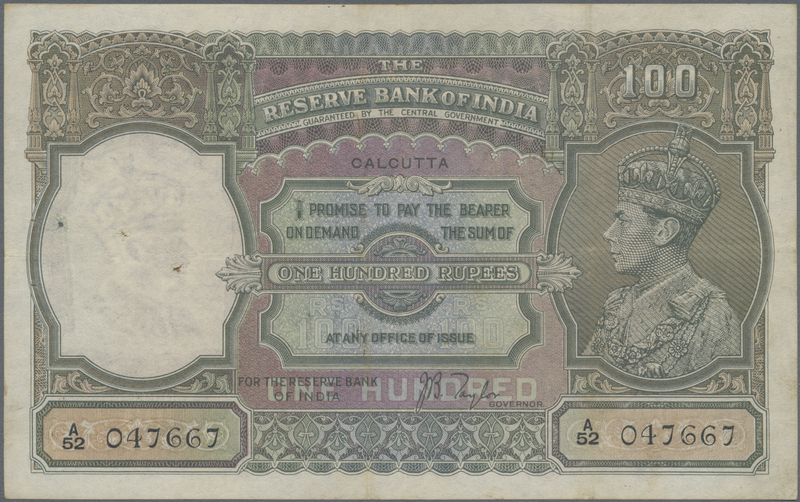 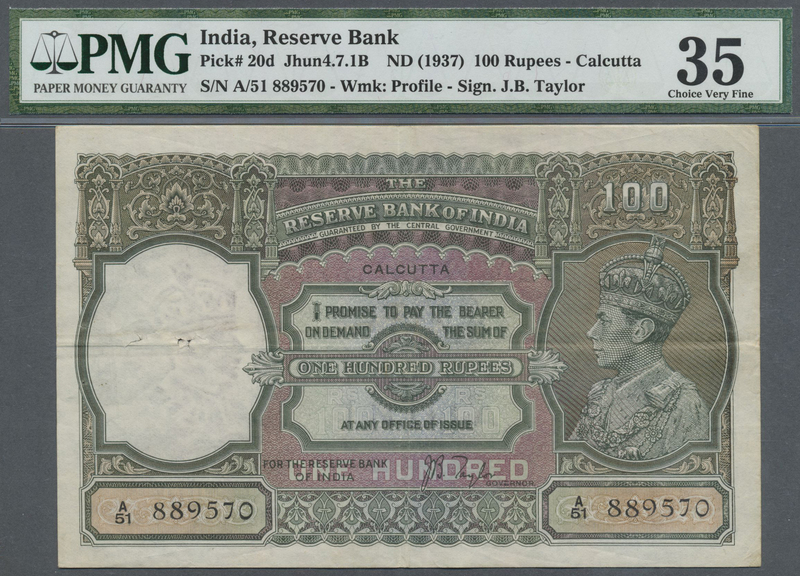 1670 Pick 20d 100 Rupees ND(1937) portrait KGIV P. 20d, CALCUTTA issue, used with folds and pinholes in paper, pressed, in condition: F+ to VF-. 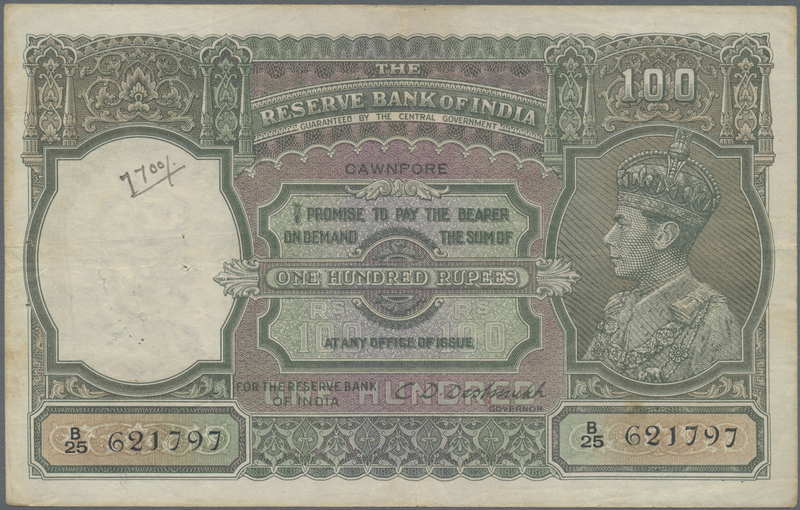 1671 Pick 20d 100 Rupees ND(1937) P. 20d, condition: PMG graded 35 Choice Very Fine. 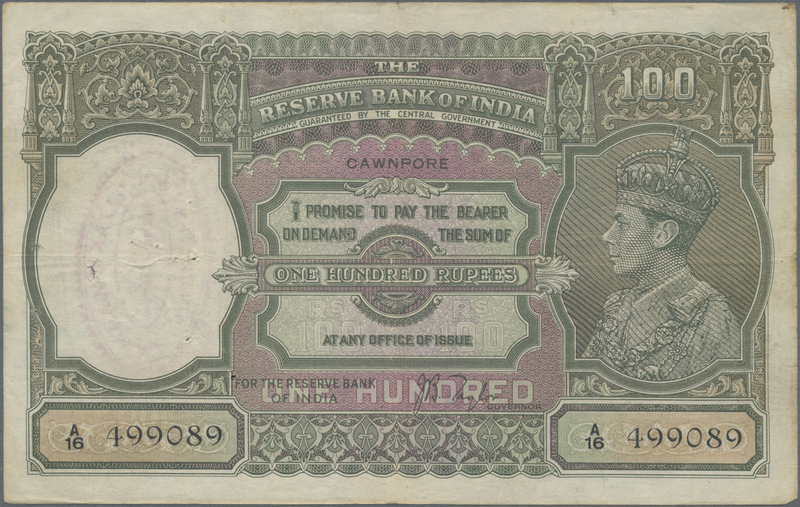 1673 Pick 20g 100 Rupees ND(1937) portrait KGIV P. 20g, CAWNPORE issue, used with folds and pinholes in paper, light stain, bank stamps on back in condition: F to F+. 1674 Pick 20h 100 Rupees ND portrait KGIV P. 20h, CAWNPORE issue, used with folds and pinholes in paper, light stain, in condition: F+ to VF-. 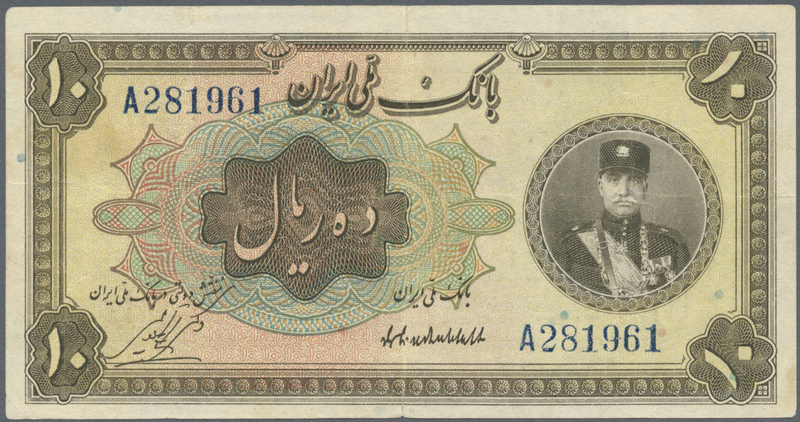 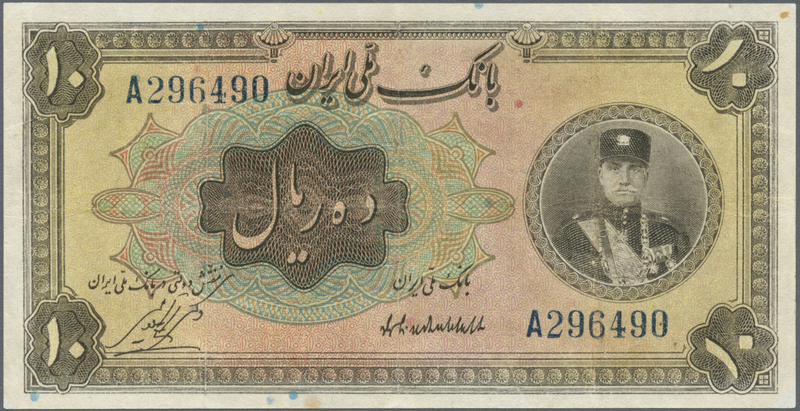 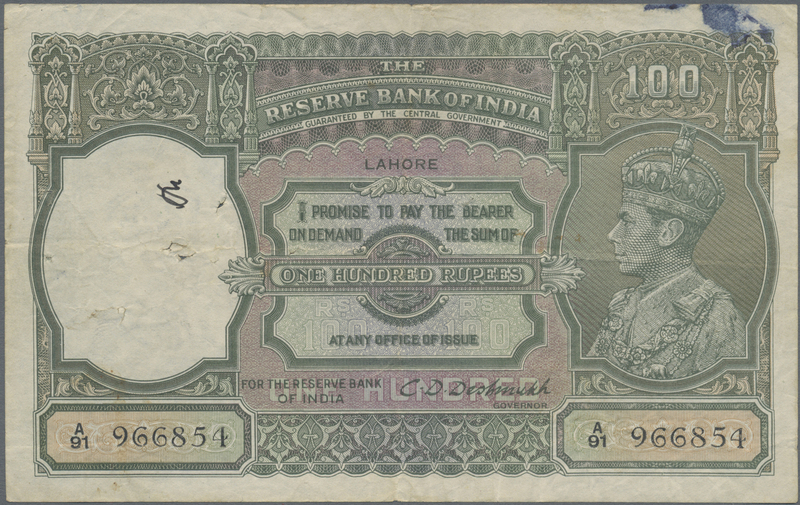 1675 Pick 20m 100 Rupees ND(1937) portrait KGIV P. 20, LAHORE issue, used with folds and pinholes in paper, ink stain, condition: F.
1676 Pick 20n 100 Rupees ND(1937) portrait KGIV P. 20n, MADRAS issue, used with folds and pinholes in paper, light stain, in condition: F to F+. 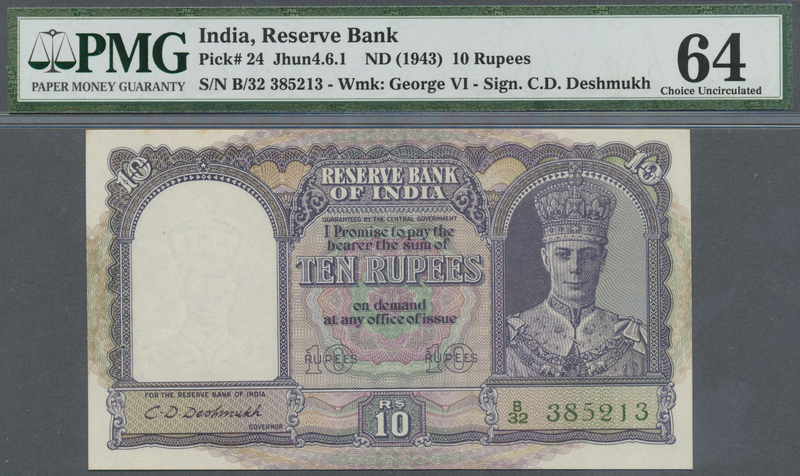 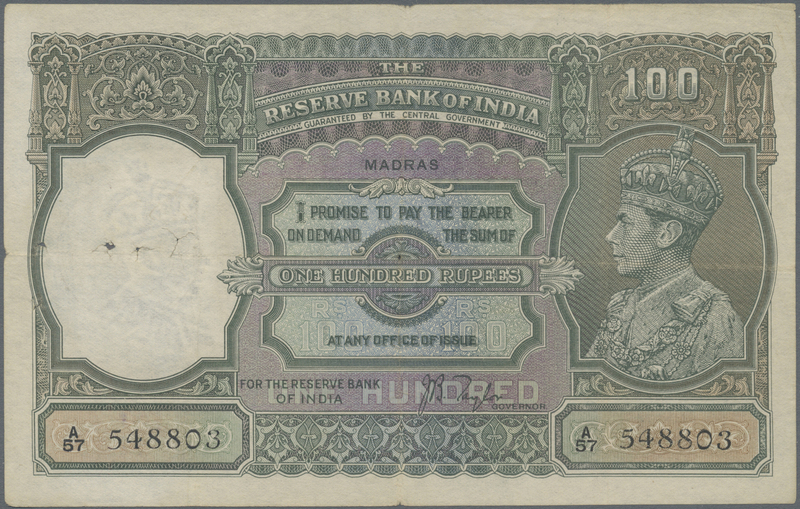 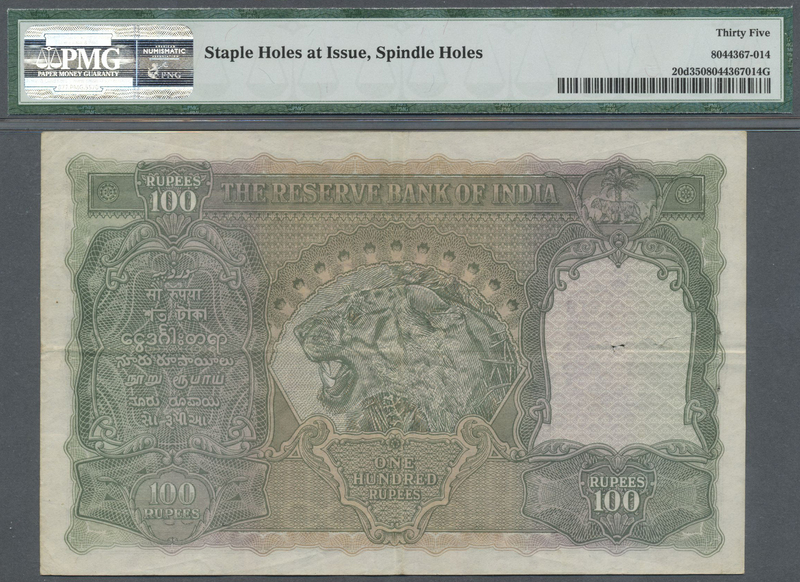 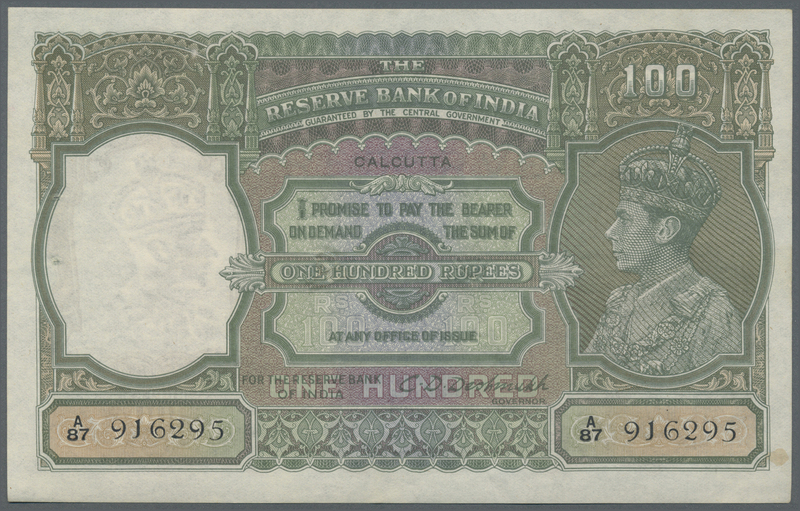 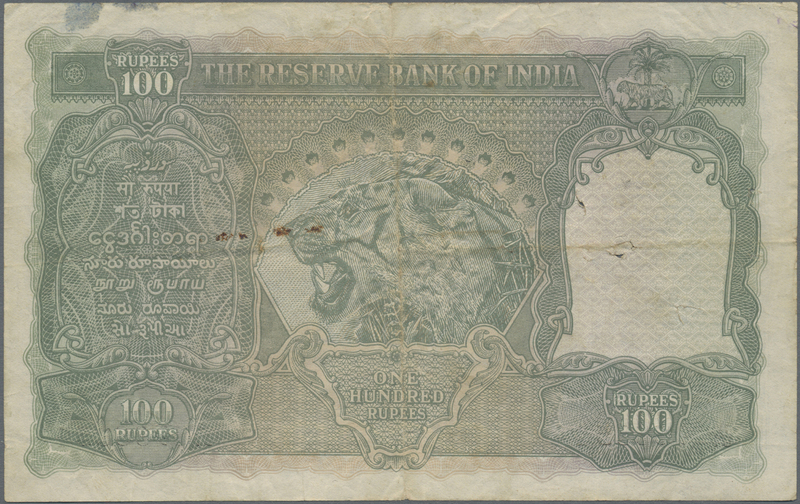 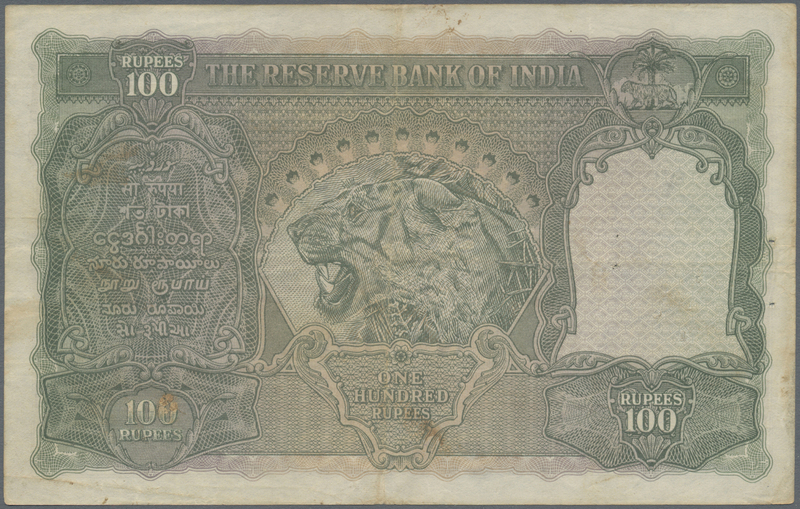 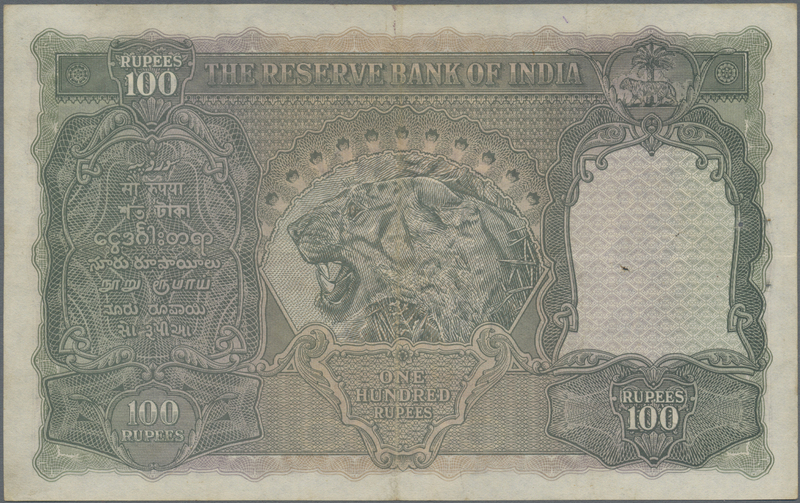 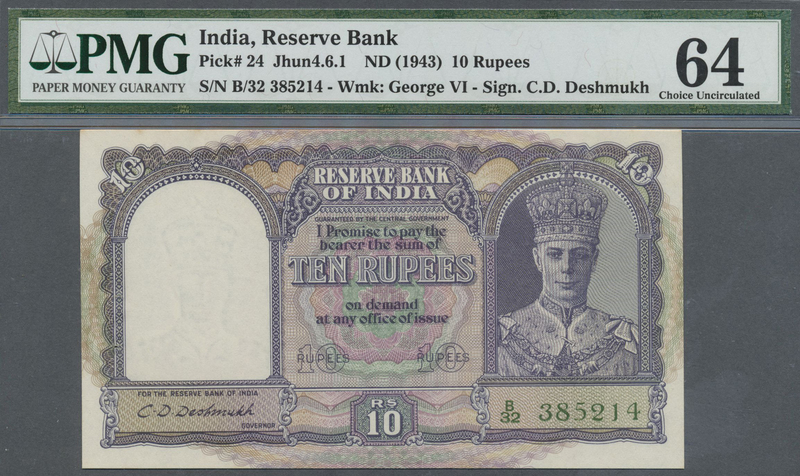 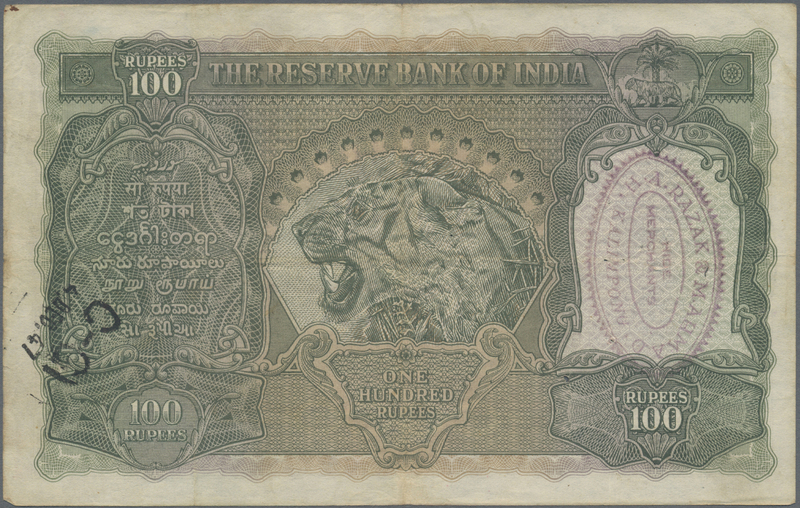 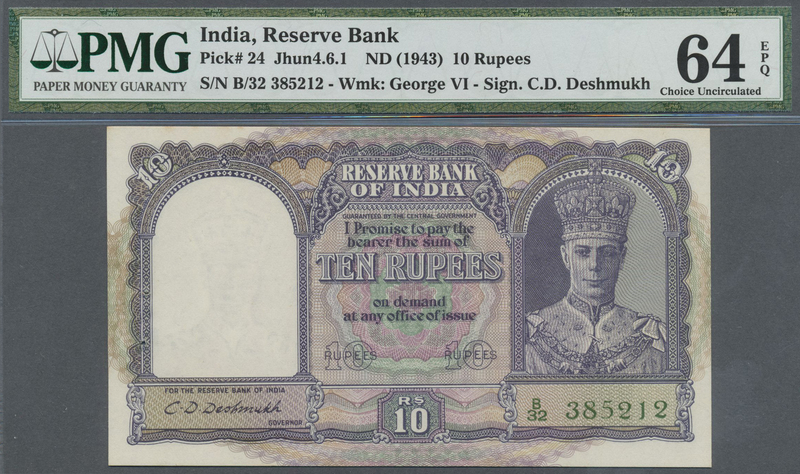 1677 Pick 20o 100 Rupees ND(1943) portrait KGIV P. 20o, MADRAS issue, used with folds and pinholes in paper, light stain, small holes, in condition: F- to F.
1678 Pick 21b rare note of 1000 Rupees ND(1937) P. 21b, issue for CALCUTTA, pinholes in paper, border restoration at left but no other large damages, paper still with crispness and original colors, condition: repaired VF+. 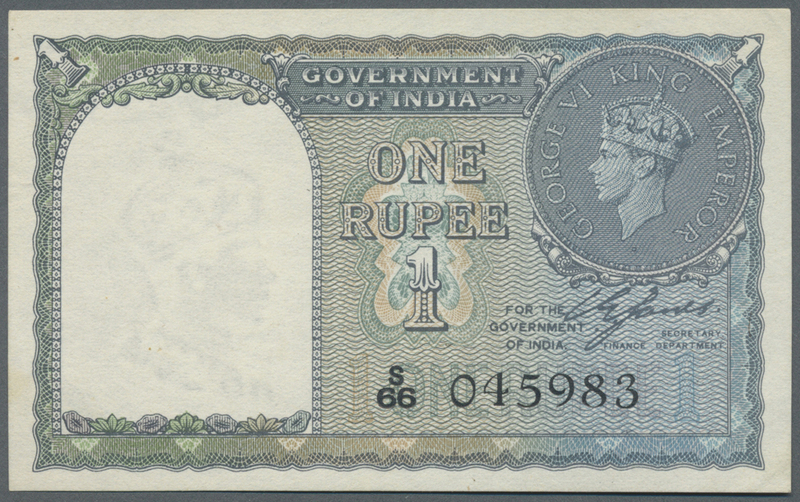 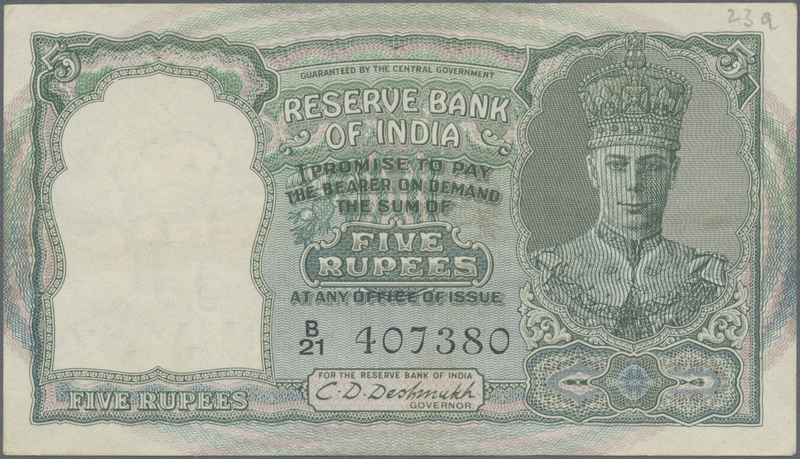 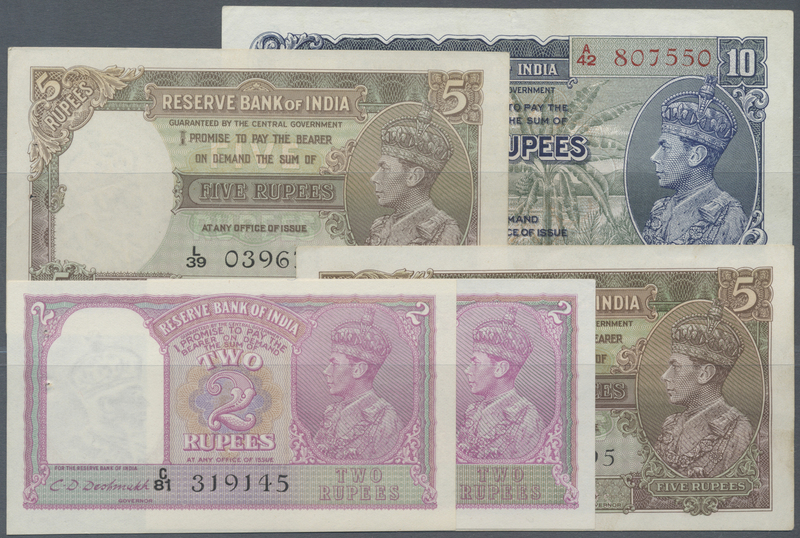 1679 Pick 23a 5 Rupees ND(1943) P. 23a, light folds in paper, black serial number, usual pinholes, original colors, condition: VF+. 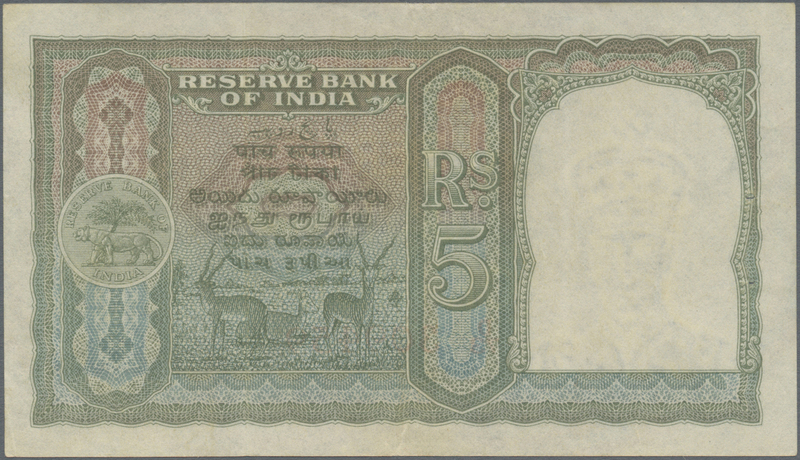 1680 Pick 23b 5 Rupees ND(1943) P. 23a, light folds in paper, red serial number, usual pinholes, original colors, condition: VF+. 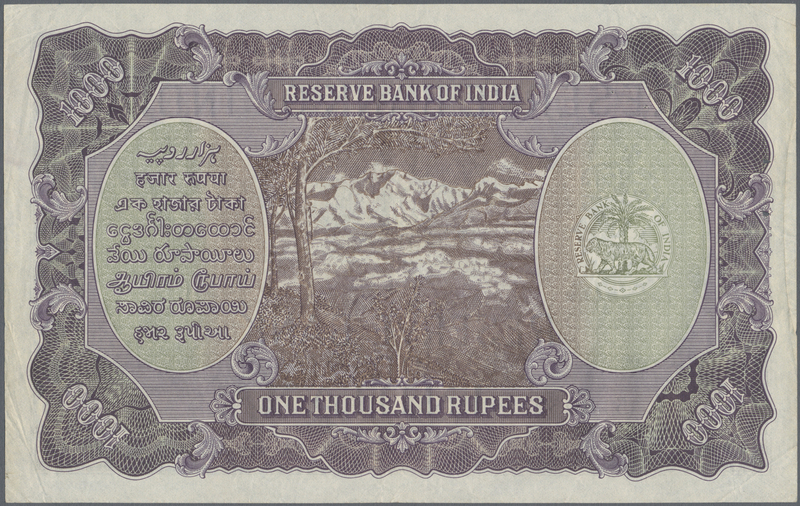 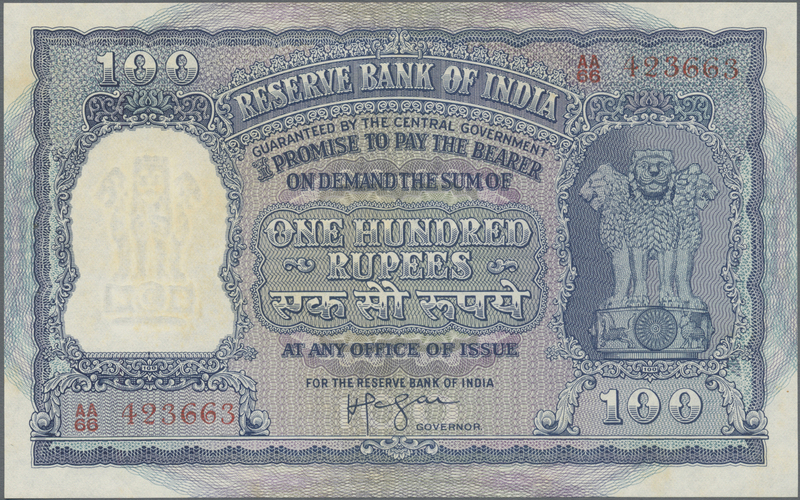 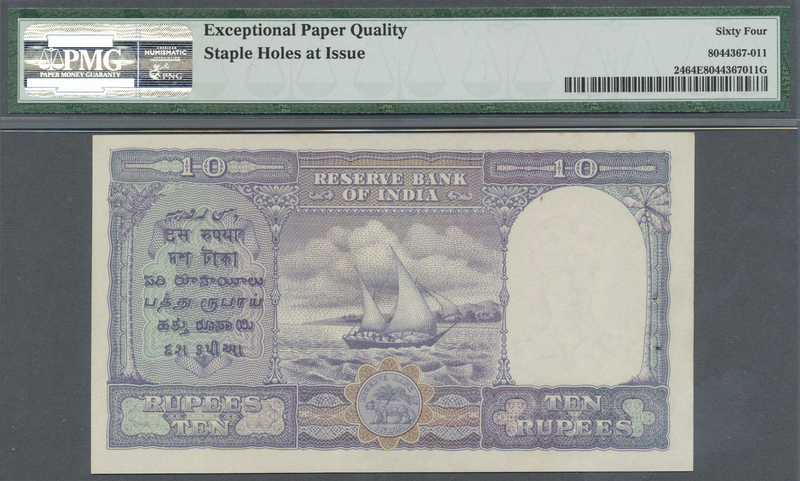 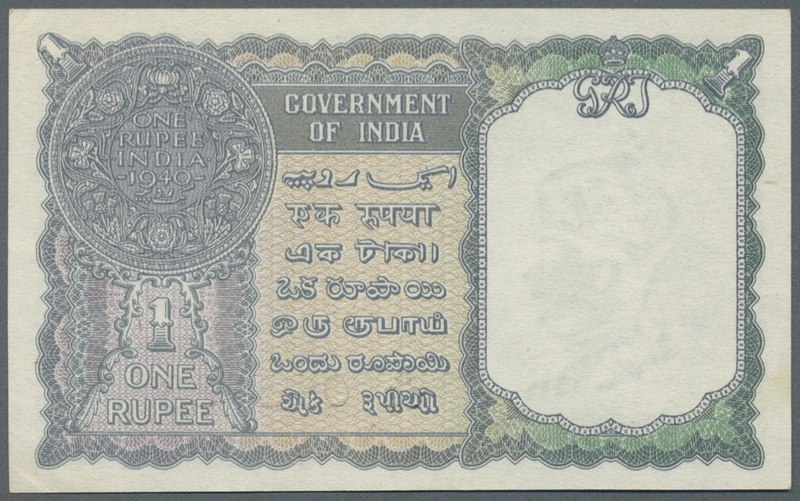 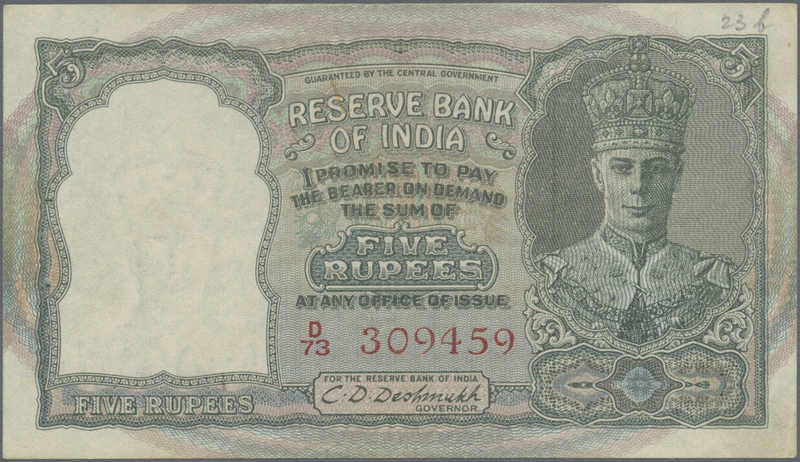 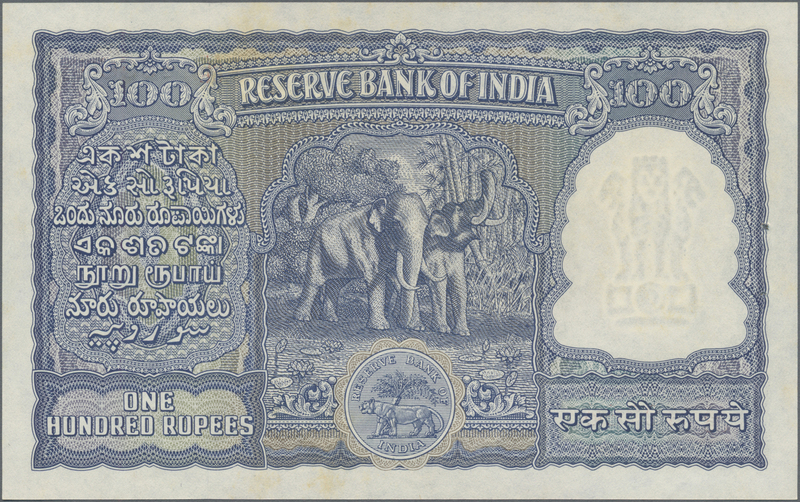 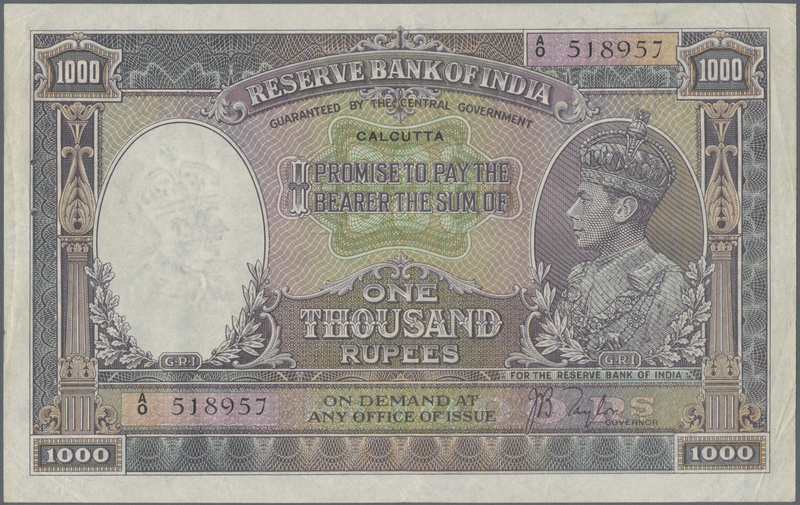 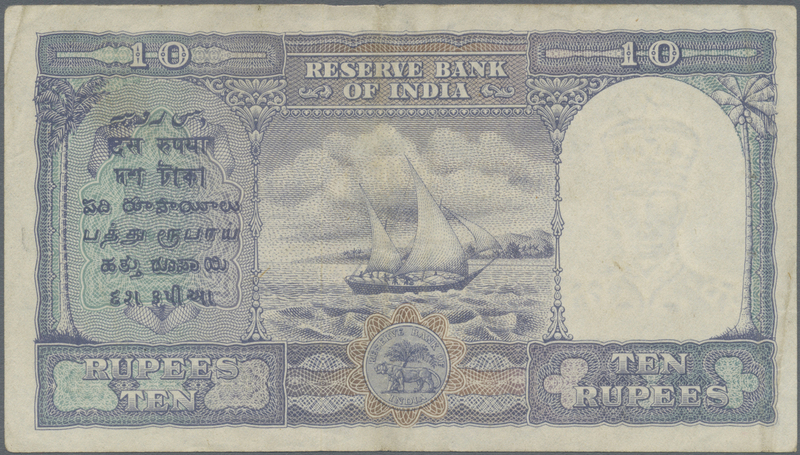 1681 Pick 24 10 Rupees ND(1943) P. 24, used with light folds in paper, 2 pinholes, still strong paper and original colors, condition: VF+. 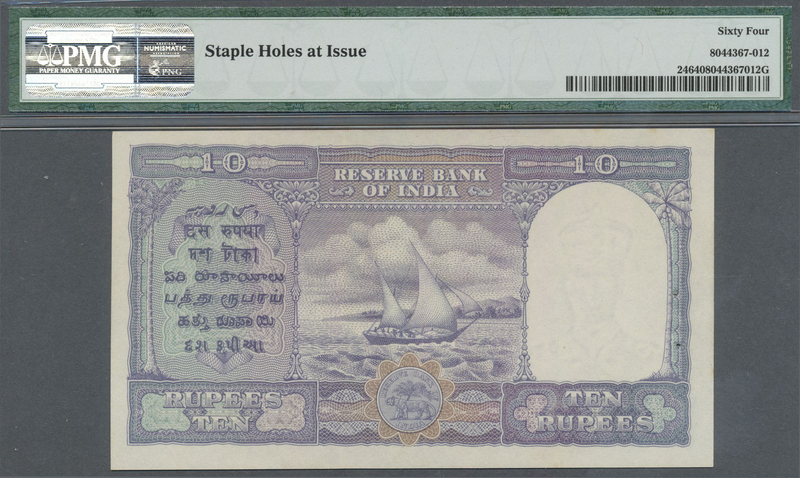 1685 Pick 43b 100 Rupees ND P. 43b, unfolded, crisp, only very minor handling in paper, light stain at left, 2 minor pinholes, conditoin: aUNC. 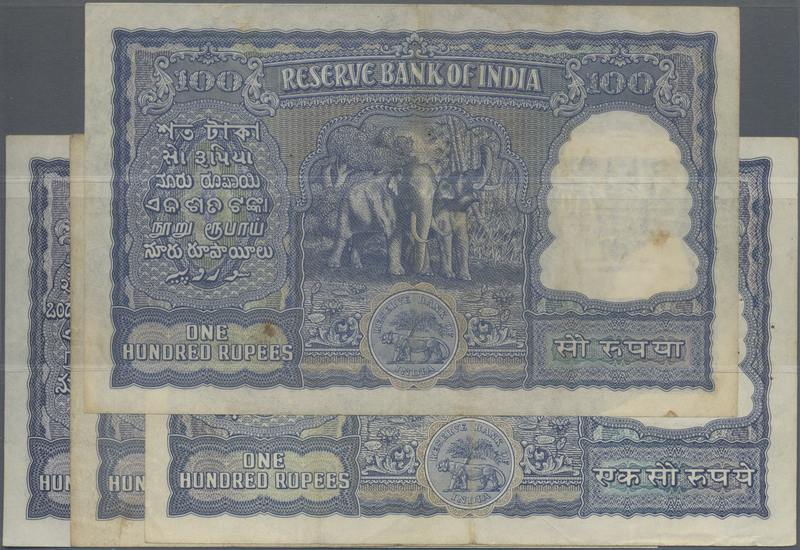 1689 Pick 93 Error 500 Rupees ND P. 93 Error note with inverted watermark in paper, light handling in paper, writing in watermark area, in condition: VF+ to XF-. 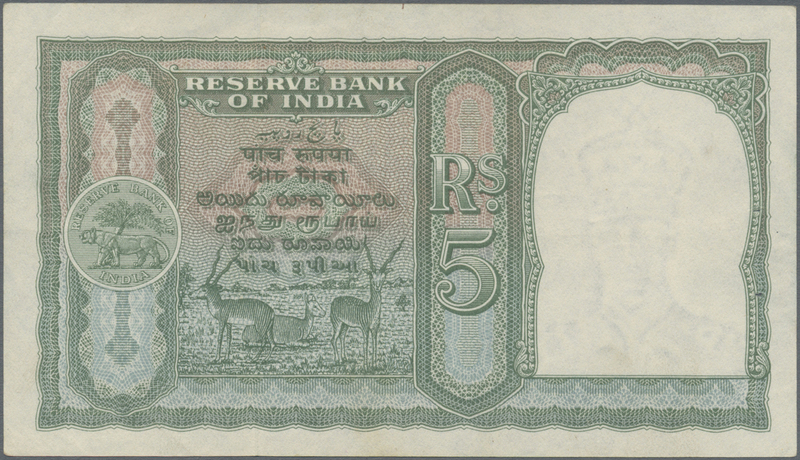 1694 Pick 95g 10 Rupees 2013 P. 95g, seldom seen Error with 7 digit serial instead of the usual 6 digit serial, in condition: aUNC. 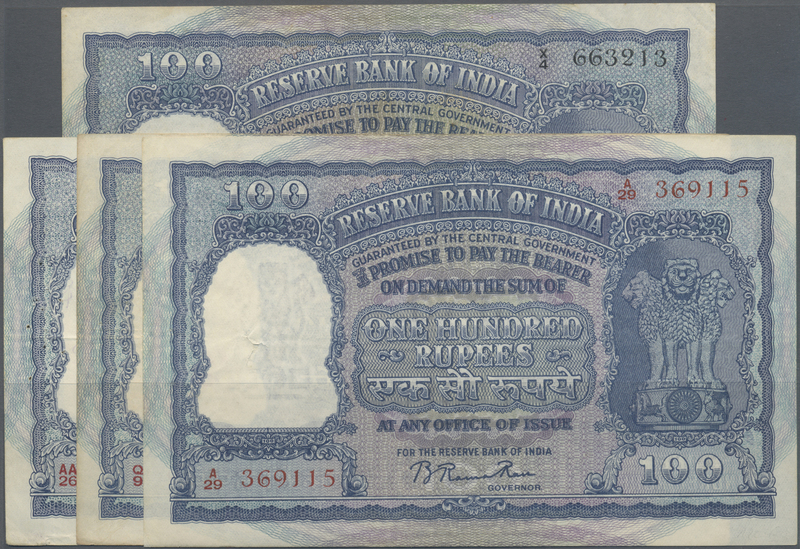 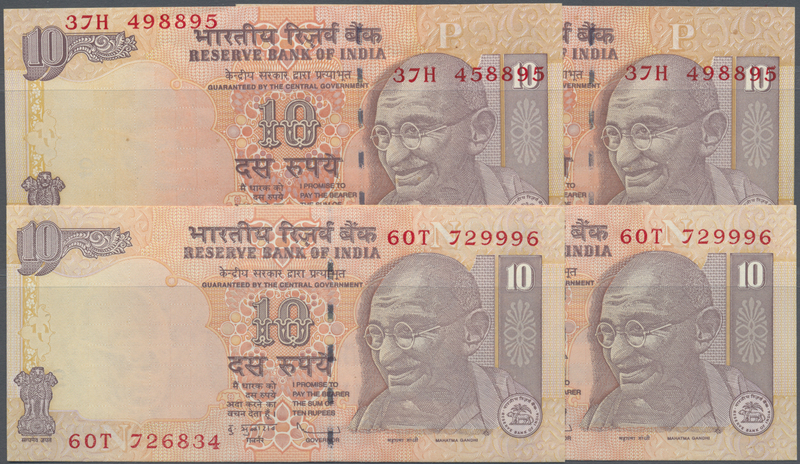 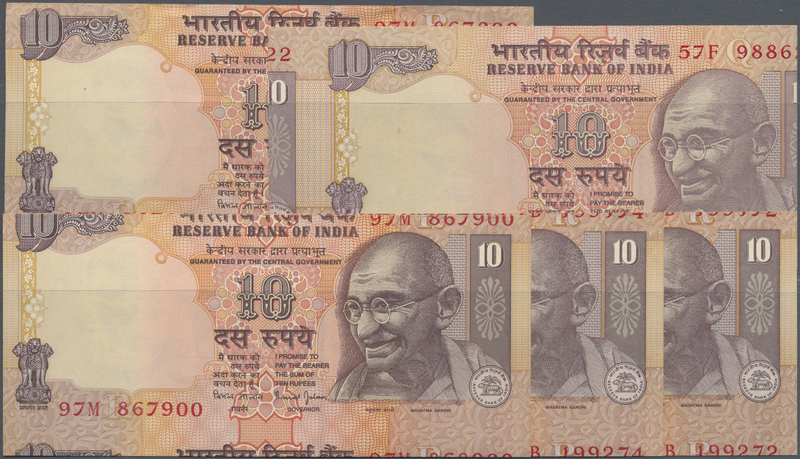 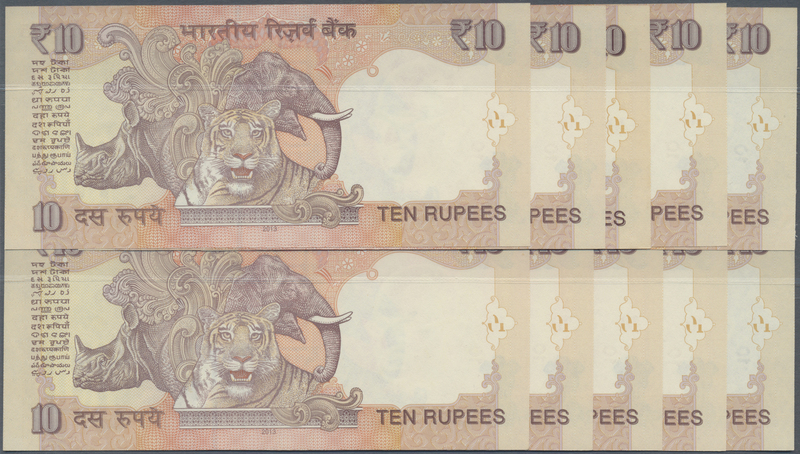 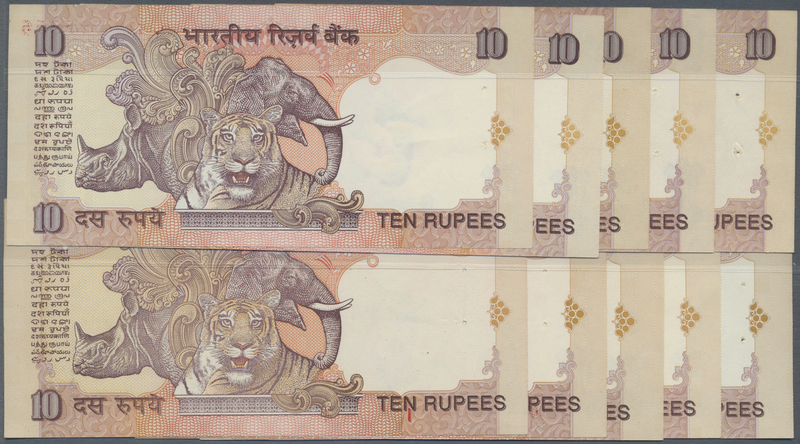 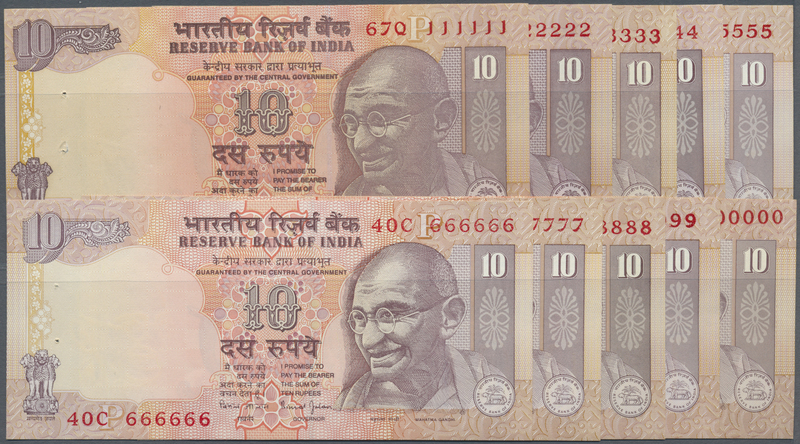 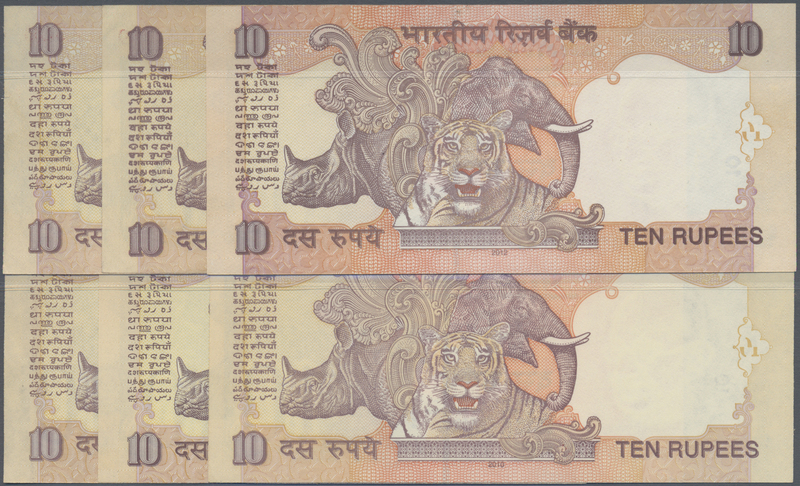 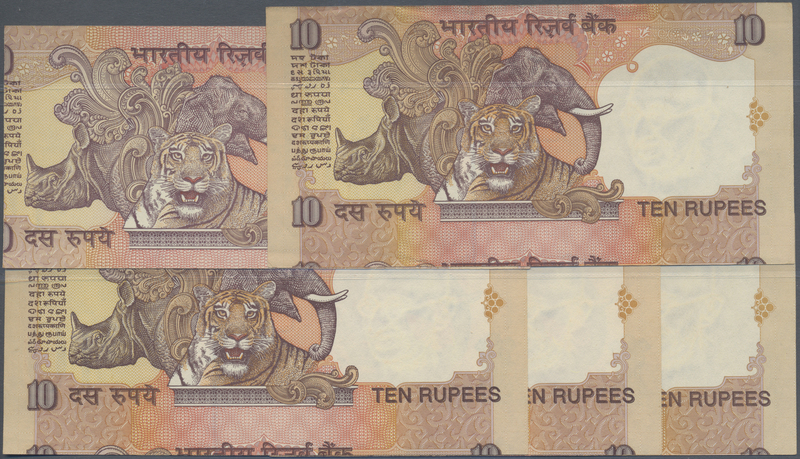 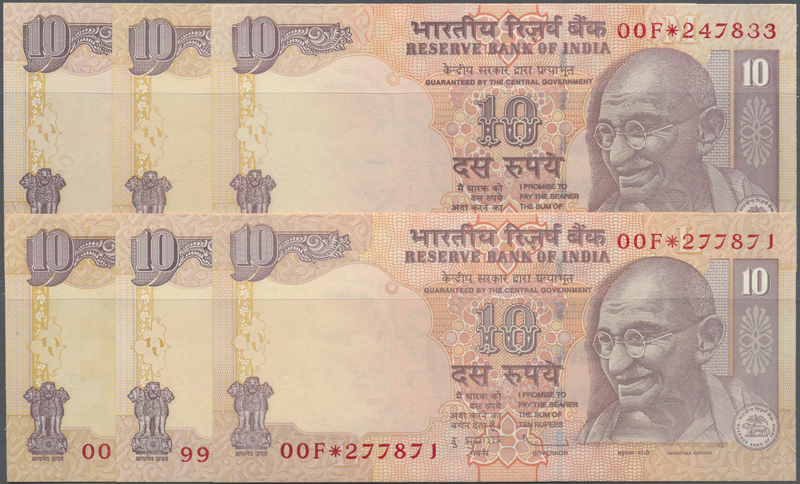 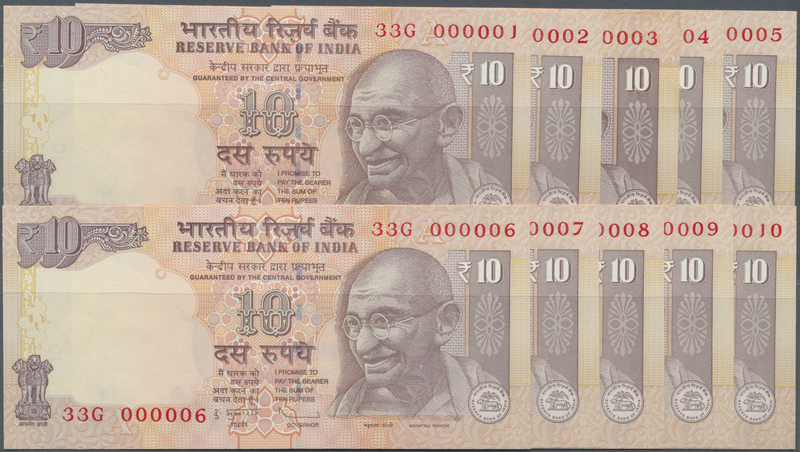 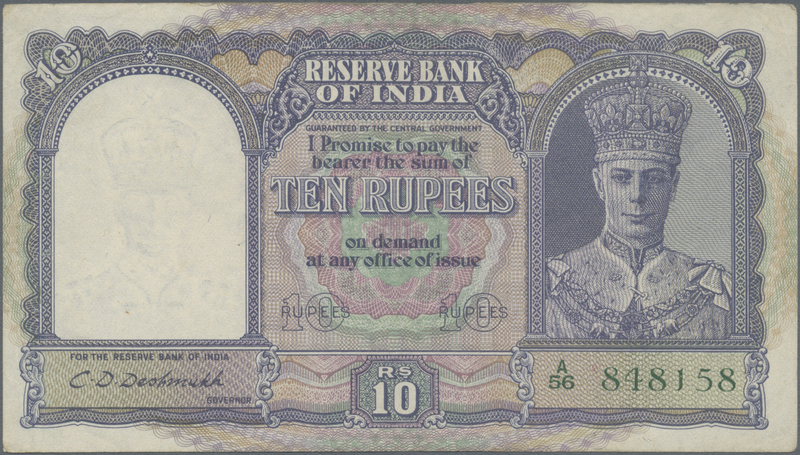 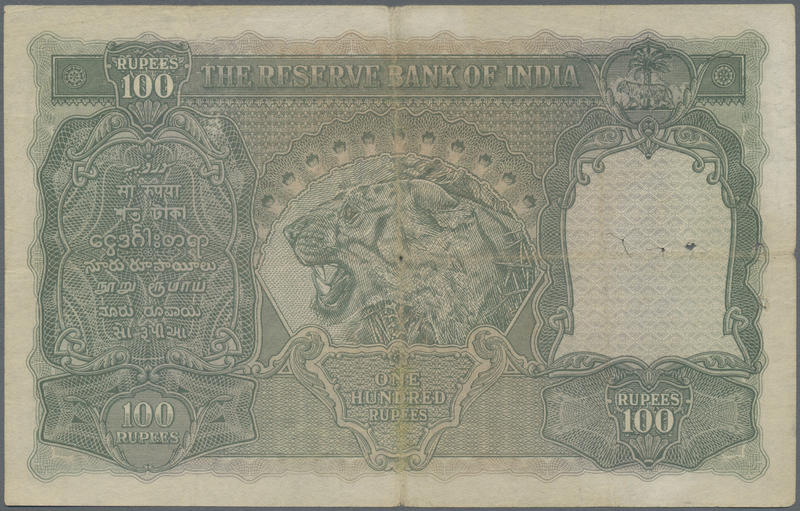 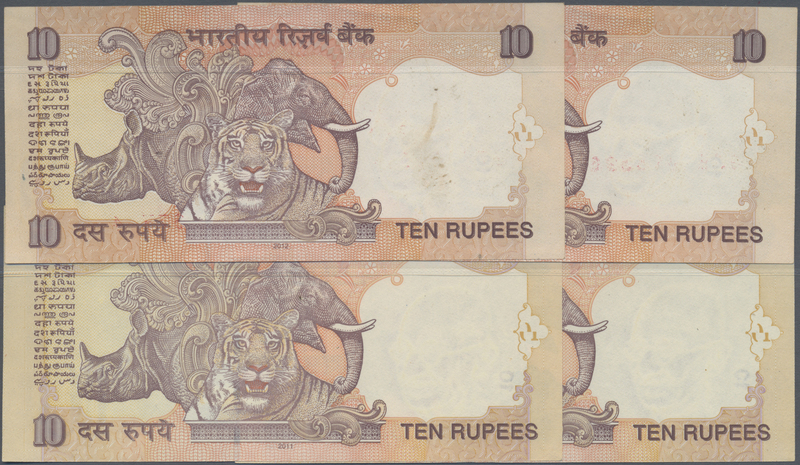 1695 Pick 98 Error 100 Rupees P. 98 Error Note, printed with 2 different serial numbers on front, in used condition with stain in paper, condition: F-. 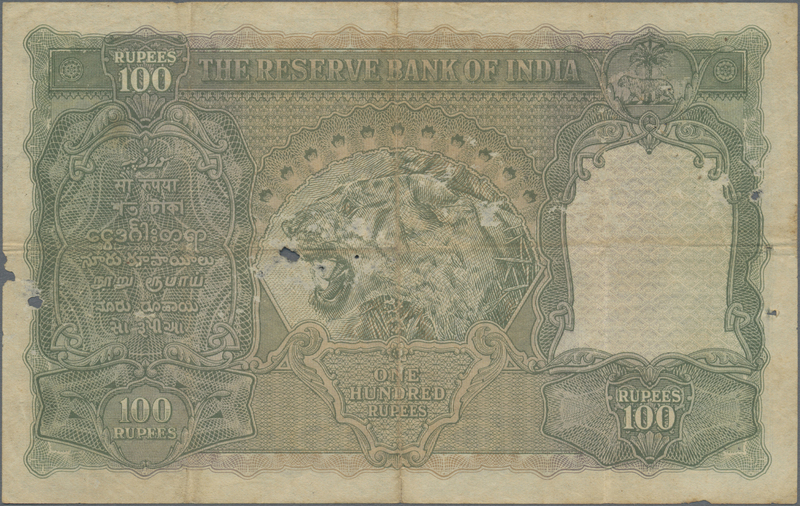 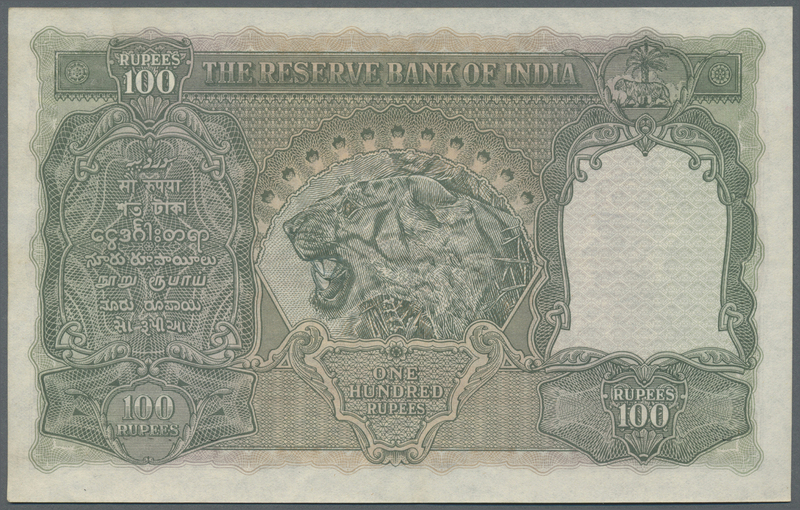 1696 Pick 99 Error 500 Rupees ND P. 99 Error note with inverted and misplaced watermark in paper, handling in paper, writing in watermark area, stains in paper, condition: VF-. 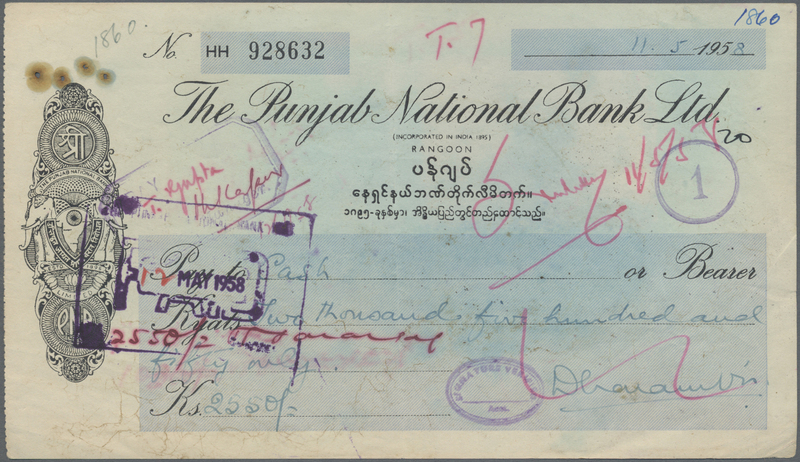 1699 Pick NL Cheque of The Punjab National Bank Ltd., Rangoon for 2550 Kyats dated 1958 with hand writings and bank stamps on paper, 4 pinholes, no tears, strong paper, condition: VF-. 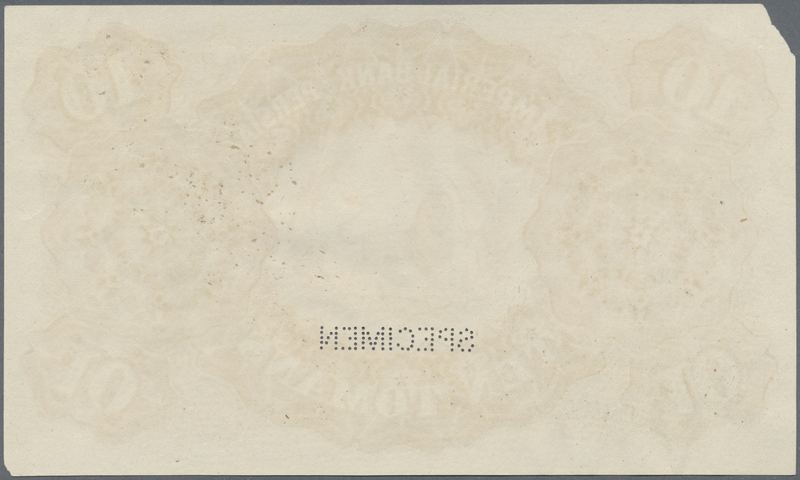 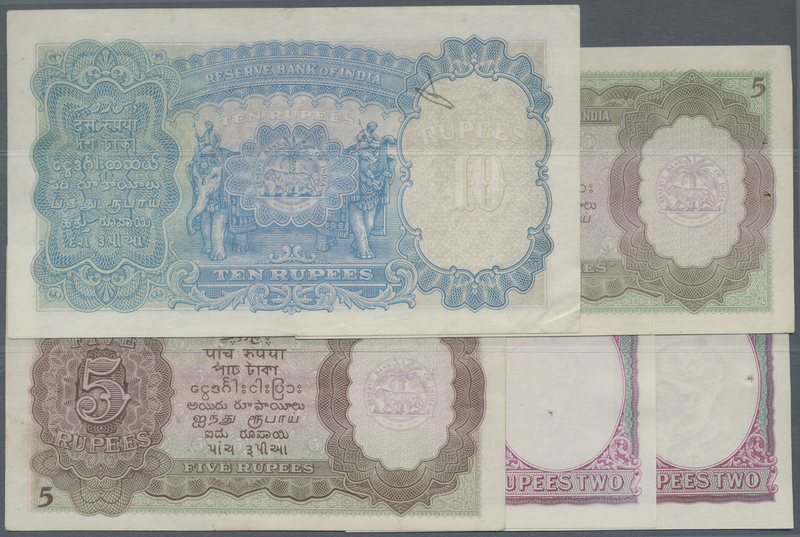 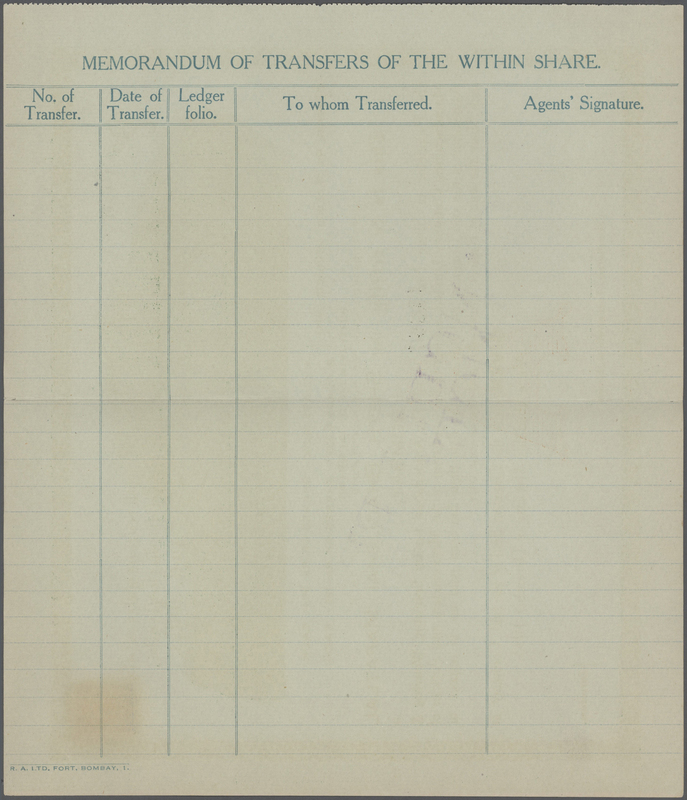 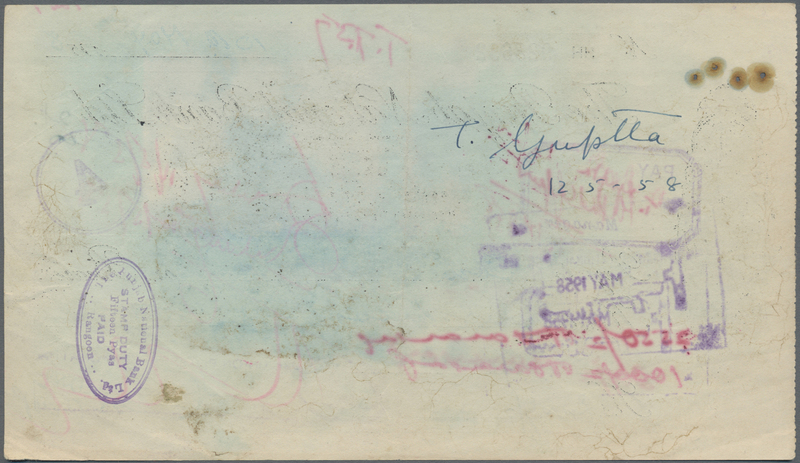 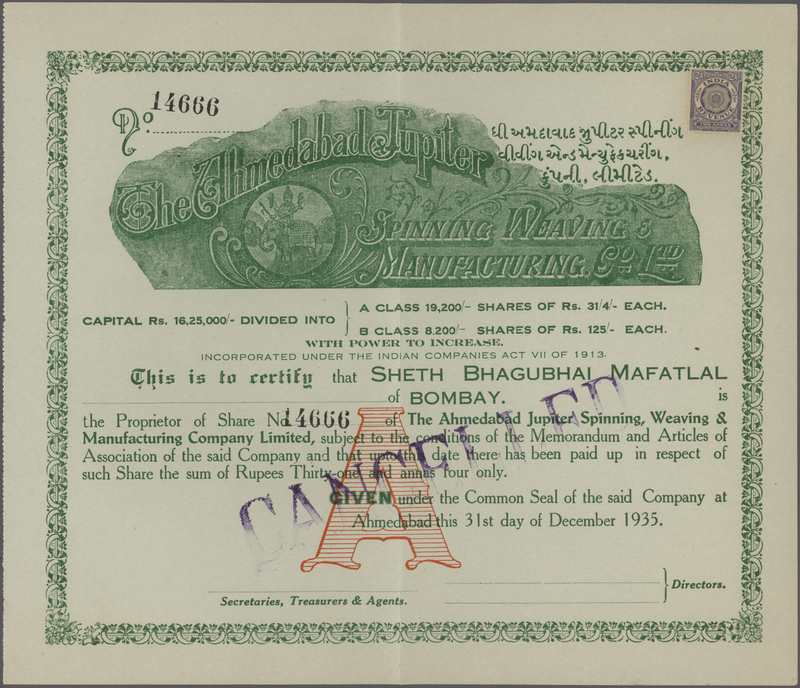 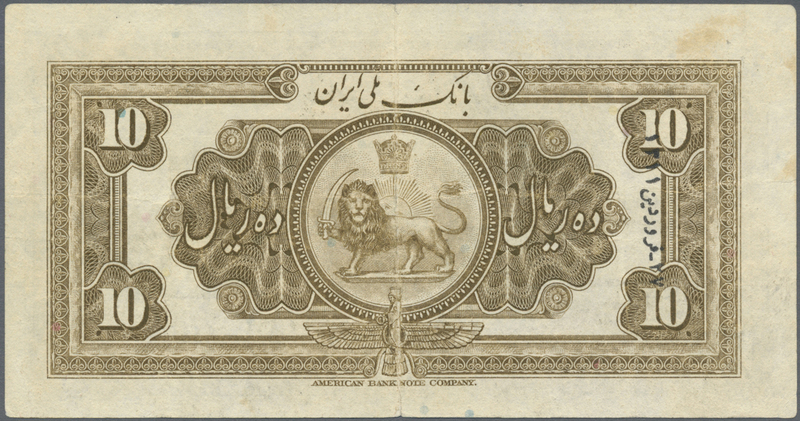 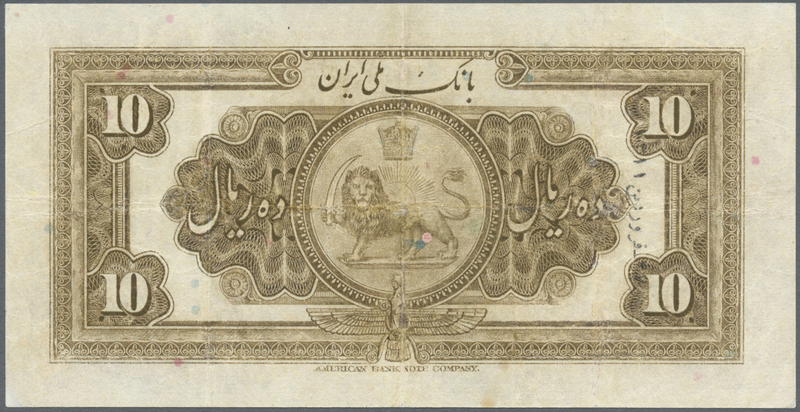 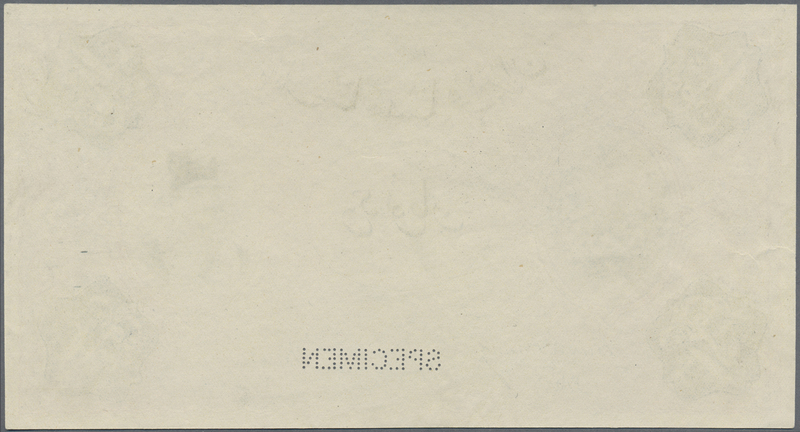 1700 Pick NL Cancelled remainder Share of The Ahmedabad Jupiter Spinning Weaving and Manufacturing Co Ltd. 1935 with only a center fold in condition: VF+ to XF-. 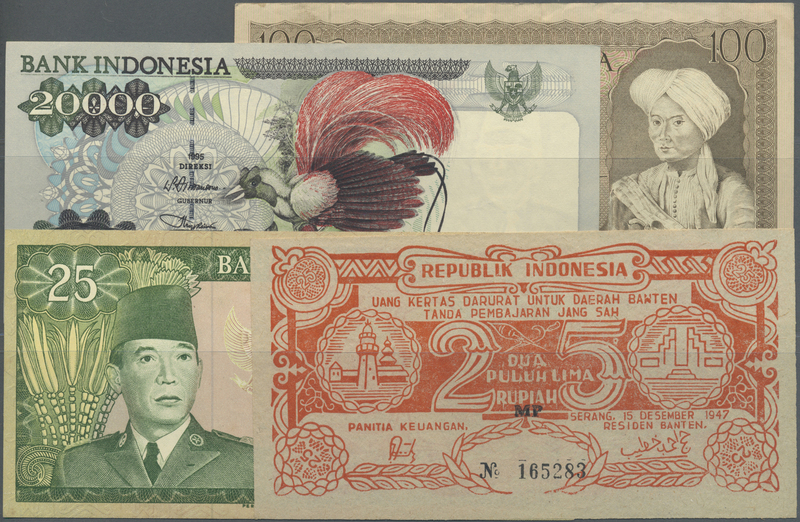 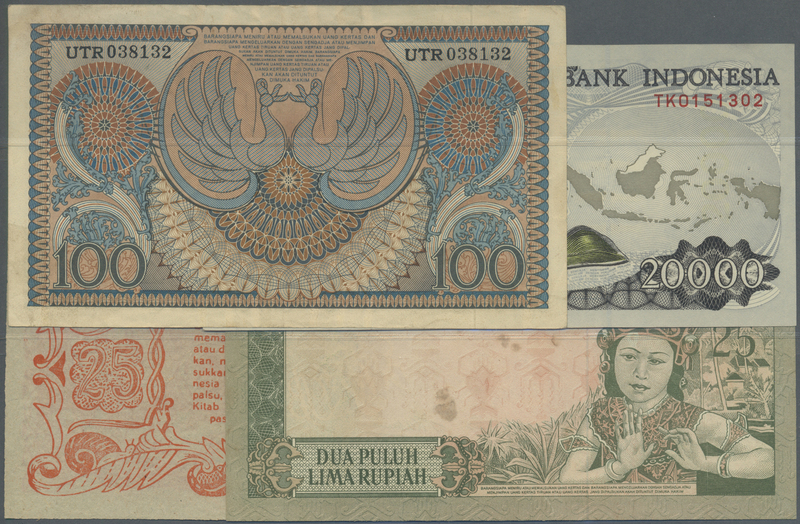 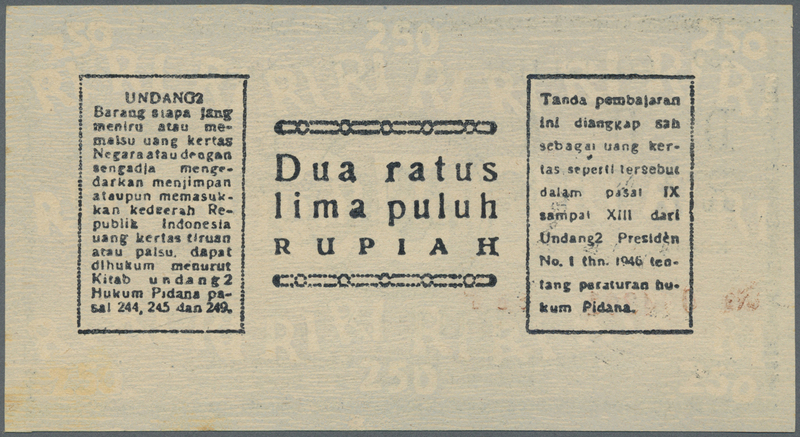 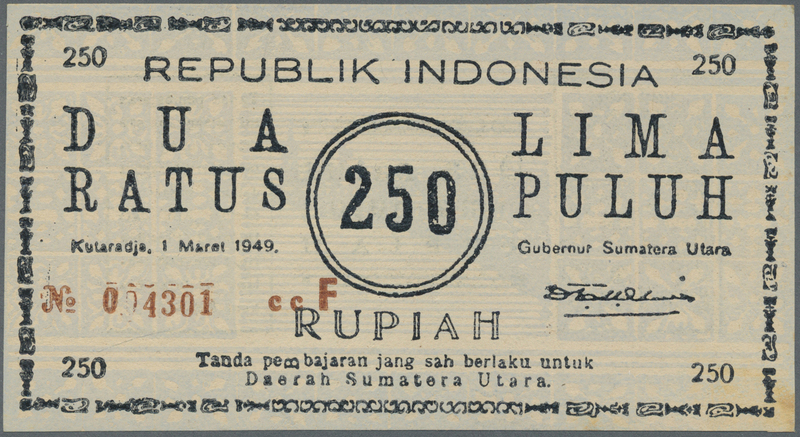 1701 Pick S286 rarely offered note of 250 Rupiah 1949 P. S286, in problem-free, absolutely crisp original condition without any damages: UNC. 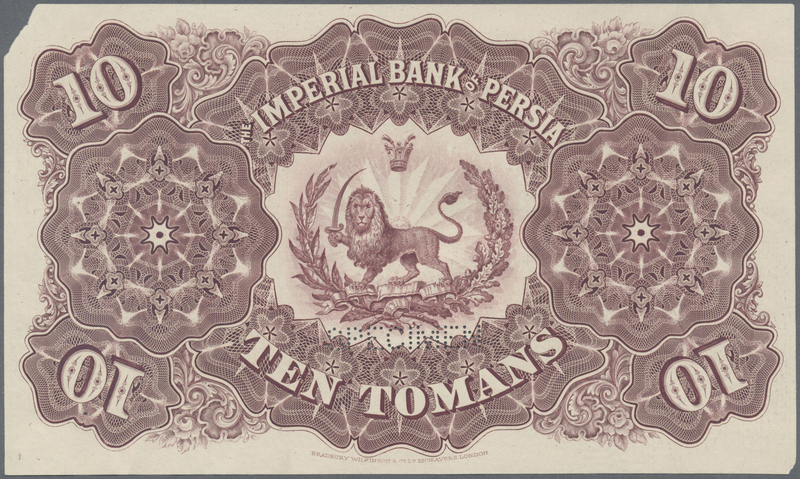 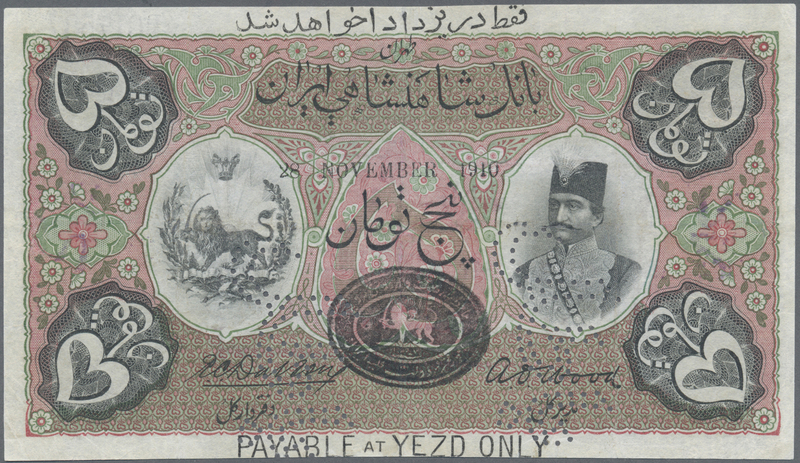 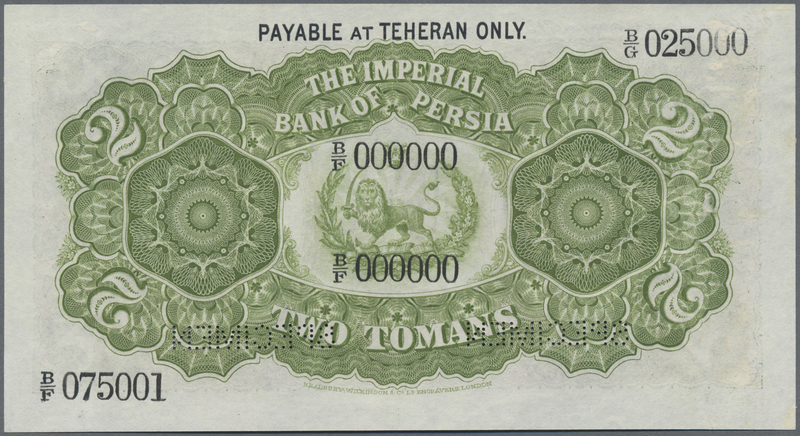 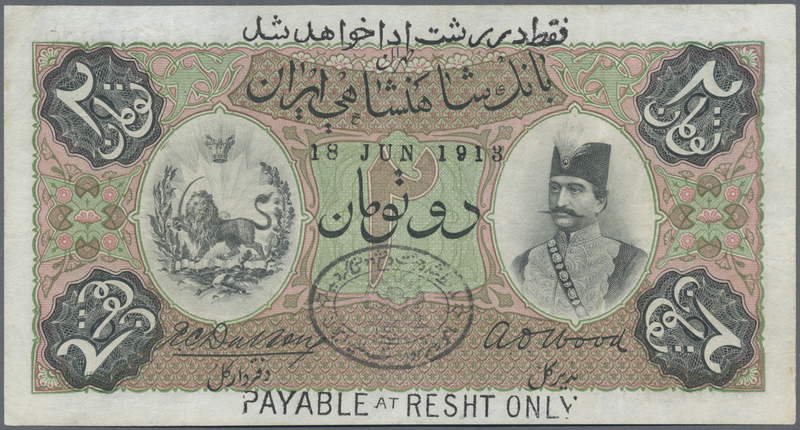 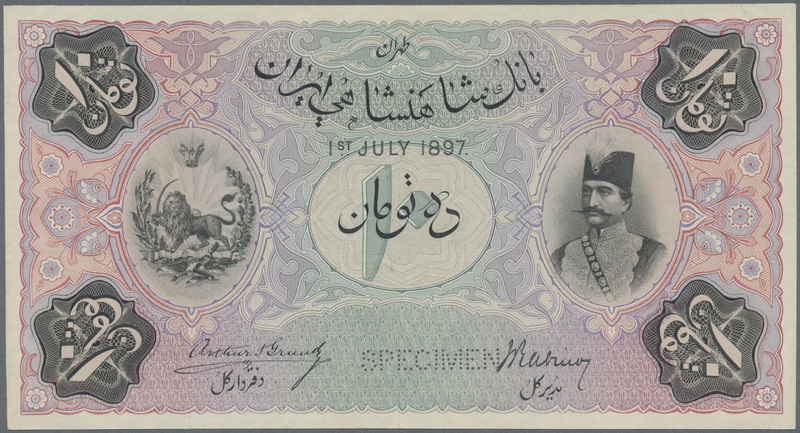 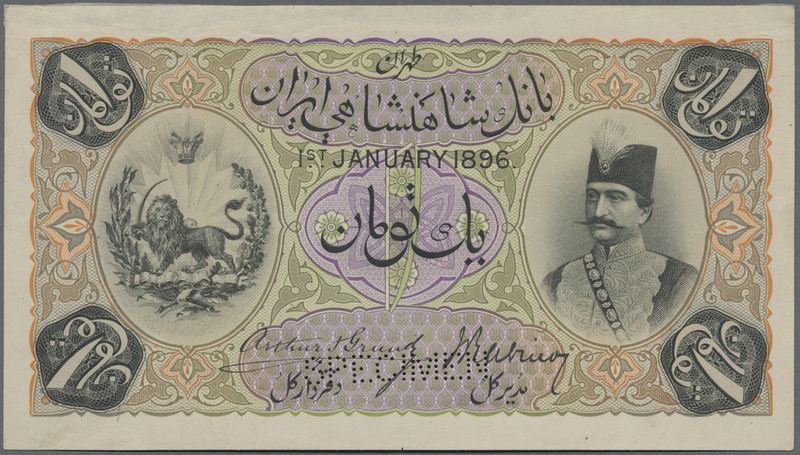 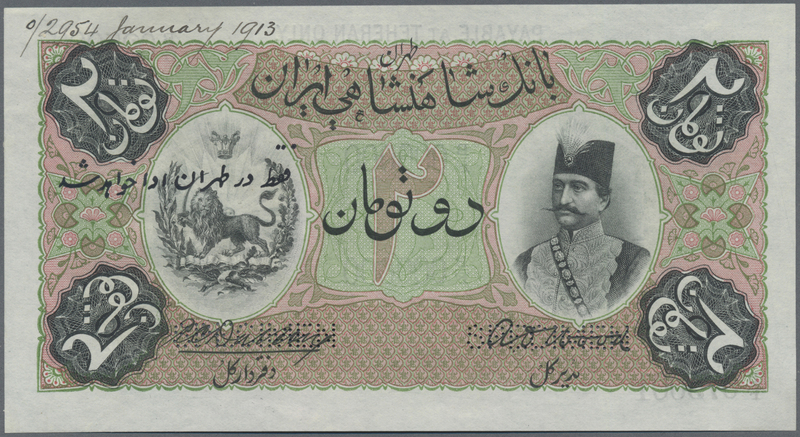 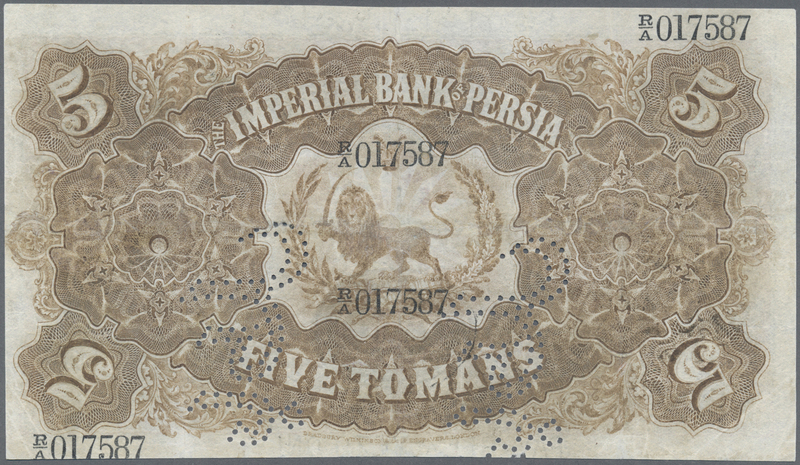 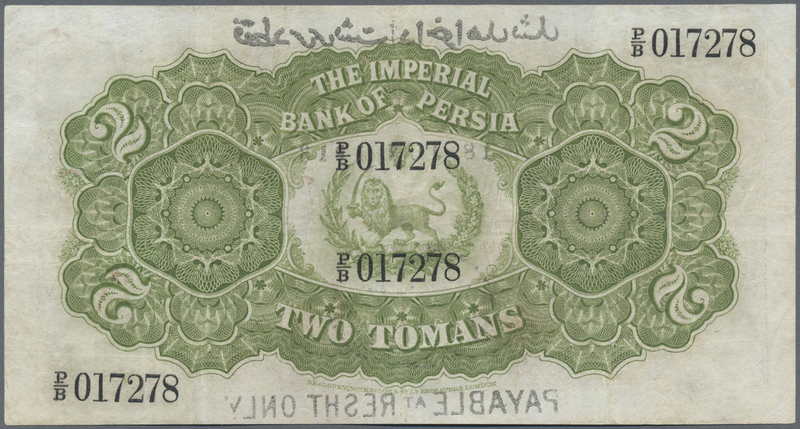 1709 Pick 19 10 Rials ND P. 19, used with folds, washed and pressed but no damages, still nice colors, condition: F.